It’s back to school time for many high school and college students…and their parents. It’s sort of a tradition at this time of year to provide some suggestions and strategies for dressing the student well, regardless of your budget. Product suggestions and personal experiences from our readers are most welcome, as I tend to not go too far afield from vendors I know and like. Also greatly appreciated will be suggestions from our Old Money Gals, as I know very little about what works in the category of Women’s Wardrobe. The Blue Blazer. At the top of the list of essential, versatile garments, this is a fundamental of your wardrobe. A year round wool will serve you best, as a worsted wool will be too hot in spring and summer, and a linen is really only for spring and summer. Fully lined. Brooks Brothers makes the iconic model (pictured below), and perhaps one of the more expensive, but options abound. Avoid trendy styles with too-thin lapels and too-short tails. Online shopping is convenient, but I’d walk into a store to make this purchase. Try the blazer on, and consider how much room you want in the shoulders: you may want to wear it over a shirt and sweater. Buy 1 blazer. The Crewneck Sweater. 100% wool or 100% cotton, this staple gets thrown over a polo shirt or cotton dress shirt when temperatures drop. Wool is obviously warmer. The most versatile colors are navy blue and charcoal grey. Burgundy and olive can appear in the rotation. I’ve received almost religious testimonies about the J Press Shaggy Dog sweater: unbelievably warm and well-made, but also eye-watering in price (pictured below). LL Bean and Lands End make durable and less expensive models, as does Ralph Lauren. Look around, shop for bargains on this one. Buy 2 sweaters. Khakis (or Chinos). These are your go-to pants. Why? Because worn with a dress shirt you can be casual but well-dressed (ball game), and with a blazer and tie you’re set for almost anything else (dinner at her parents house…?). 100% cotton. Not too loose, not too tight. Cuffs or no cuffs, your call. Bill’s Khakis makes a high-quality, durable model. They are made in America and are not inexpensive, but wear well. Consider Orvis. The Usual Suspects–Brooks Brothers, Lands End, LL Bean and Ralph Lauren–also sell these at varying price points. Buy four pair. Dress Pants. Invariably 100% wool and invariably charcoal grey. Cuffs for a dressier look. I’d lean toward Brooks Brothers for a year round model that’s traditional in style. Be careful not to buy a pair that fit too low on the hips. They often look too casual. Think about purchasing them unfinished and have a tailor measure you for the appropriate length. Note: the appropriate length for a pant is just touching your shoe tops, or a little longer. Pants that are too long make you look sloppy. Try to avoid that. Buy one pair. Dress Shirts. Key garment here. They should be durable enough to handle commercial washing machines but quality enough to compliment your blue blazer. 100% cotton. Long sleeve. White or blue for starters. Button-down or pinpoint collar. Button cuffs are more versatile than French cuffs. There are chemicals in ‘wrinkle free’ fabrics that you may not want near your skin. Think about it. For college students who may be attending an alumni mixer one minute and playing touch football the next…in the same clothes…consider Mercer and Sons. The oxford cloth fabric is canvas-heavy, the construction is brick-outhouse, the cut is full. Not inexpensive, but they last forever (pictured below). 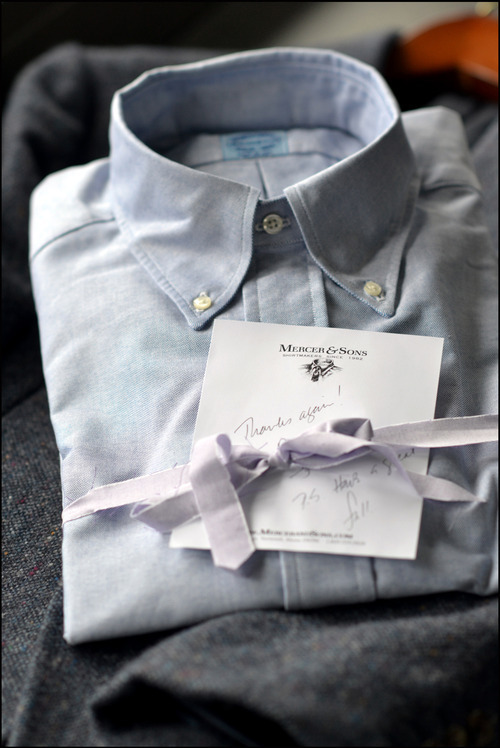 Ralph Lauren makes a quality oxford cloth shirt as well. I suggest oxford cloth because it is durable. Durable will be your watchword until you graduate. Say it with me…durable. Buy 5 dress shirts. Polo Shirts. These are 100% cotton short-sleeve pullovers. They are worn alone, under a sweater, under a button-down, or under a sweater and a button-down, which is just crazy. But warm. I’d start with solid colors in (again) navy blue, burgundy, and olive. Ralph Lauren and Lacoste make iconic models, as does Brooks Brothers. Lands End and LL Bean have theirs. These are the upgrade to T-shirts, which I abhor as visible clothing. I still consider T-Shirts underwear, but I’m a dinosaur. Buy 5 polo shirts. Brown Casual Shoes. Boat shoes. Sperry Topsiders. LL Bean boots. These are your go-to, anywhere and any-weather shoes. Mud, rain, beer–these shoes should be ready to face it all and be no worse for the experience. They are an upgrade from sneakers and can be worn with khakis and a blazer for a solid, casual look. Buy 1 pair. Brown Dress Shoes. Penny loafers or lace-ups. Brown. Brown is less severe and more versatile. My standby brand is Allen Edmonds for lace-ups. I’m a Strand man. American made, not inexpensive, but they last forever (pictured below). Bass makes the iconic penny loafer. I am not up-to-date on the quality of their products. Keep the style traditional. Avoid exotic skins, pointy-toes, square toes, and stacked heels. Monk straps are an option if you’re feeling stylish, but lace-ups are the first stop. 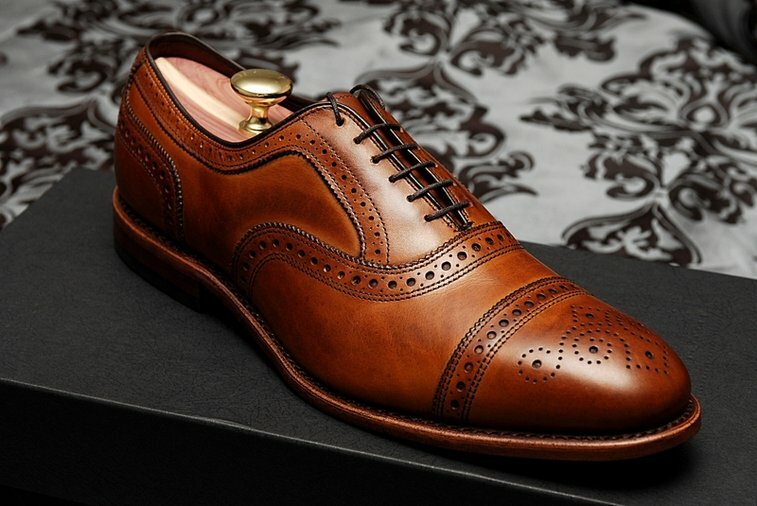 Opt for leather soles, at this point, even if rubber-soled dress shoes are widely available. Dress means dress. Buy 1 pair. Neckties. Rep ties, or regimental striped ties, as they’re often called, are available everywhere. Red, blue, green, and yellow diagonal stripes in various combinations are traditional, popular no-brainers, appropriate for 99% of your needs in school. A navy blue Swiss dot necktie will cover the more formal events. 100% silk, not too skinny, not too wide. Bowties can be an option. Learning to tie one can be a challenge. Buy 2 neckties. Why dress this way? Several reasons. First, you’re in school to learn, not to attract undue attention by dressing horribly. Second, you’re in school to learn, not to impress other students with how much money you’ve spent on your wardrobe by becoming another casualty in the Sophomore Logo War. Third, you’re in school to learn. One of the things you will learn when you do your own laundry is how practical, convenient, and durable the above items can be to wear and maintain. No one will know how much money or how little money your family has. Your wardrobe won’t be out of style next fall. You’ll be comfortable, stylish in a timeless way, and judged on your own merits. Good stuff, generally. I wish you the very best of luck this school year. I would suggest that a young lady pack cotton and wool sweaters and turtle necks, brown and khaki cords and cotton khakis. One pair of button fly jeans. Three button down shirts, a couple of skirts, two pair of flats and a good pair of low heels. At least two nice dresses and a pair of pearl studs. One flannel night gown and one light weight cotton night gown. Two sets of good cotton sheets, a down comforter and down pillows. This is a good list for fall. This list was my own when I started college and it held me well. 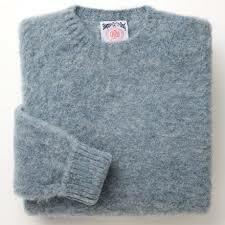 A lot of it was LL Bean with some Skyr wool sweaters thrown in. The dresses were silk made by my Mum and a woolen one from Talbots. I would not mind at all if you placed this list on another post. I currently shop LLBean, Geiger, Quoddy and House of Bruar for classic well made clothing. Totally agree with your style choices. Dressing that way for 35 years. You lean on an expensive total, though, for the average student. Could go with Lands’ End Hyde Park OCBDs; less than Allen Edmonds, though I love them now and have 3 pair, could not afford them in college; and a department store such as Dillard’s house brand blazer. Still not sue about brown shoes with blue blazer and gray flannels, though. Hard for my eyes to handle that. But every item in your list I own, save the Mercer shirt. I have BB, LE and several RLs. Really enjoyed reading your post. Fab descriptions. I’d like to add for OM Gals that a nicely cut wool pea coat and a gabardine belted trench coat (both in neutral colours) would serve her well into Autumn and early winter. These will serve both Day and Night use. Plus wool tights, lots of wool tights! To add warmth beneath lighter weight trousers (I’ve noticed the manufacture of khaki trousers for women’s styles aren’t quite as weighty as the men’s). Plus they are handy to utilise skirts even in bitter weather. They look particularly charming with wool skirts and penny loafers. I agree with all your recommendations, Byron, and have tried to educate my sons for years now (they’re nearly 20 and 18) but they just don’t get it. Perhaps, it’s because they went to a charter school with a strict dress code (not unlike the style of dress you recommend) and this is their way of rebelling. While I went to a public high school in Los Angeles back in the 60’s, it was an upscale school and we all dressed preppy due to the dress code. They dropped it the following year after I graduated in 1968 and the place became like something out of Haight-Ashbury. May I add in the women’s wardrobe for the northern climates a good pair of black or brown waterproof leather boots. They can be worn with a skirt, jeans, dress pants, etc. Properly maintained they can last decades. Thank you, Byton for the timeliness of this topic. I am going school shopping with my 16 year old next week and clothes is the first agenda item. Every college girl needs a little black dress she can dress up or down with accessories. Wool and cotton socks for both ladies and gentlemen. The wool are especially useful at night in those drafty dormitories! I would also like to suggest a Gloverall Duffle coat for walking across a cold campus. J.press sells them. In terms of Polo shirts the lacoste is the most comfortable in hot humid climates just remember to get one size too large because if your not careful they will shrink in the dryer. I have enjoyed the last posting and this one hopefully you will cover cars next. The Bass Weejuns are still well made in ME. I purchased 2 Mercer OCBD’s a couple years back and “unfortunately” proceeded to lose 40 lbs so now I swim in them. Brooks 346 line is what I wore in college along with RL outlet and RL hand me downs. Had several trad tweed sport coats and Blazers from thrifting as well: Southwick, RL and Brooks. Any advice on quintessential OMG accessories? Hi PD, I thought about being snarky and replying, “A stack of cash and a few gold bars in a Swiss vault”, but that wouldn’t be very nice. So, in the spirit of your question, I would say very few accessories, and of good quality, inherited whenever possible. Personally, whatever I have and use on a daily basis just has to work well and last. You can find photos or portraits of nearly every U.S. first lady wearing a strand of pearls. Definitely an Old Money Gal accessory. As ever, it was a joy to read your blog. It has been a semester or two since I started sporting day-ascots in my attire, and, I must admit, I find it much more comfortable and in line with my personality than necktie or a bow-tie. Since I make a point to present myself humbly, I always ensure that I do not fall into the ‘brash yacht owner category’. Given that ascots seem to have fallen out of favour, I would love to hear about your views, or the views of the readers if possible, on the subject. What about cold weather accessories such as gloves, a warm hat, some wool socks, cold weather boots, and possibly a scarf? LL bean perhaps?